This manual explains the "Diagnosis" (found in the "Diagnostics" section) and "Removing and Installing, Replacing, Disassembling, Installing and Checking, and Adjusting". "Final Inspection" is omitted. The following essential operations are not written in this manual. However, these operations must be performed in actual situations. An alphabetical INDEX section is provided at the end of the book as a reference to help you find the item to be repaired. Use of Special Service Tools (SST) and Special Service Materials (SSM) may be required, depending on the repair situation. Be sure to use SST and SSM when they are required and follow the working procedure properly. A list of SST and SSM is in the Preparation section of this manual. 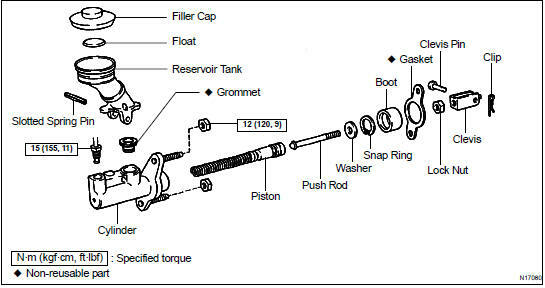 Torque specifications, grease application areas, and non-reusable parts are emphasized in the procedures. NOTICE: There are cases where such information can only be explained by using an illustration. In these cases, all the information such as torque, oil, etc. are described in the illustration. Only items with key points are described in the text. What to do and other details are placed in illustrations next to the text. Both the text and illustrations are accompanied by standard values and notices. Illustrations of similar vehicle models are sometimes used. In those cases, specific details may be different from the actual vehicle. The illustration shows what to do and where to do it. The task heading tells what to do. The explanation text tells how to perform the task. It also has information such as specifications and warnings. HINT: This format provides an experienced technician with a FAST TRACK to the necessary information. The task headings are easy to read and the text below the task heading provides detailed information. Important specifications and warnings are always written in bold type. SPECIFICATIONS are presented in bold-faced text throughout the manual. The specifications are also found in the Service Specifications section for quick reference. The units used in this manual comply with the SI UNIT (International System of Units) standard. Units from the metric system and the English system are also provided.